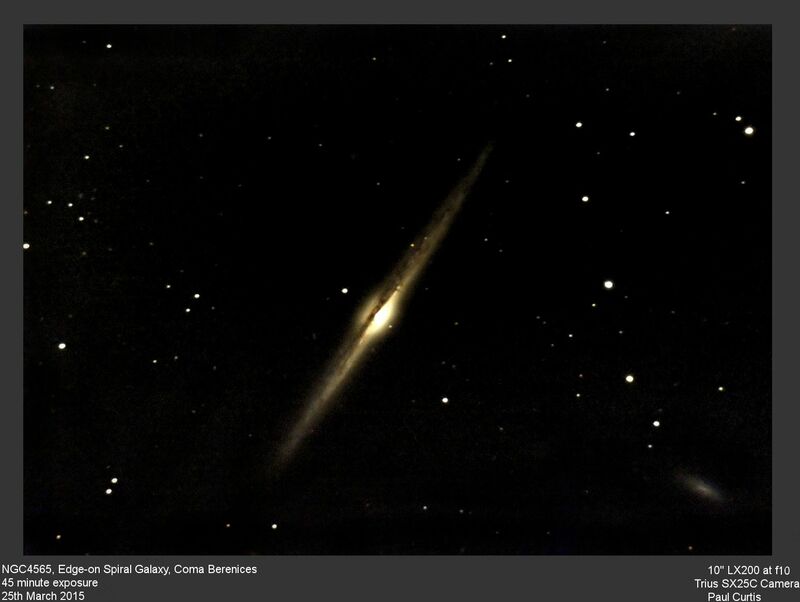 NGC3115, 'Spindle Galaxy', E-S0 Spiral Edge on Galaxy in Sextans, - 10" Meade LX200 SCT f4, Starlight Xpress MX5 CCD. Multiple exposures : Effective integration time 21 minutes. 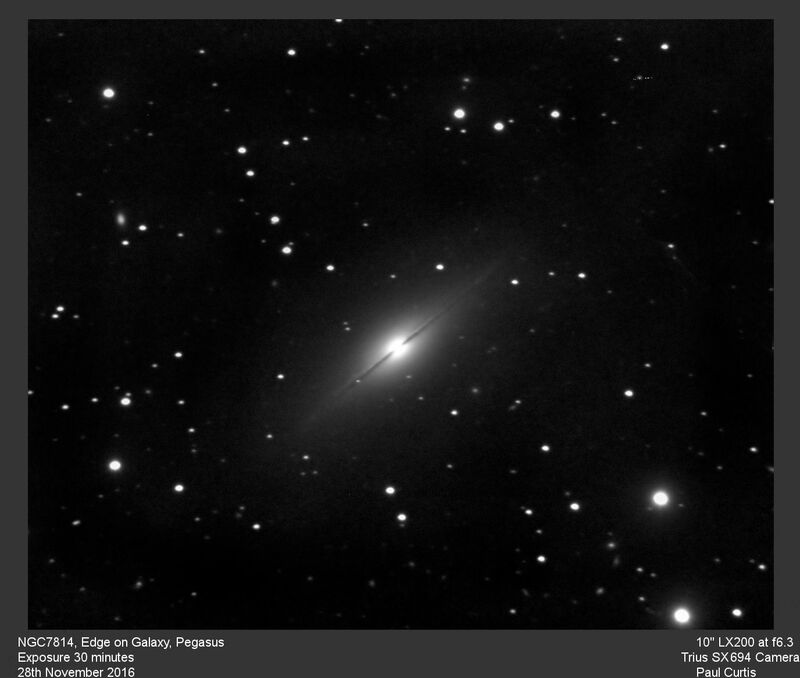 NGC 4216 - Edge-on Sb spiral galaxy in Virgo, Mag 10, 8.5 x 1.7'. 10" Meade LX200 at f4, Starlight Xpress SXVF-MX9 CCD. 18 minute exposures. 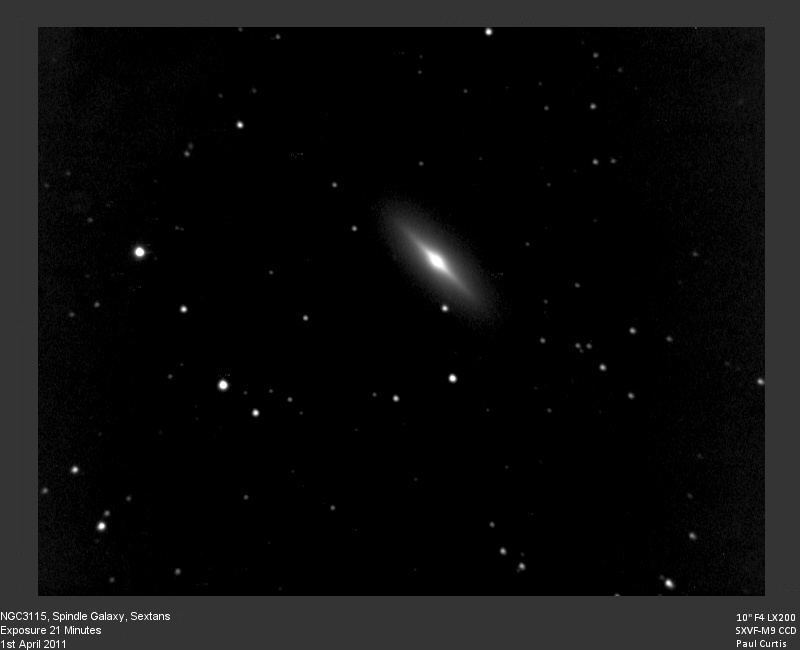 NGC5965 - Sb Edge-on Spiral Galaxy in Draco, Mag 11.7, 6' x 0.9'.- 10" Meade LX200 SCT f6.3, Starlight Xpress MX5 CCD. Multiple exposures : Effective integration time 15 minutes. 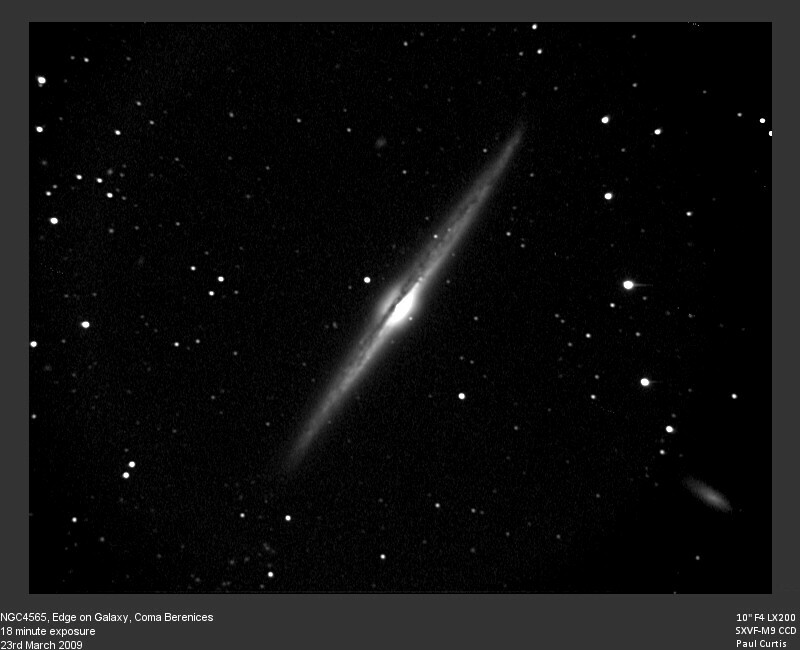 NGC4565 Sb Spiral Galaxy in Coma Berenices, Mag 9.6, 15.5 x 1.9' - 10" Meade LX200 SCT f4, Starlight Xpress MX9 CCD. Multiple exposures : Effective integration time 18 minutes. 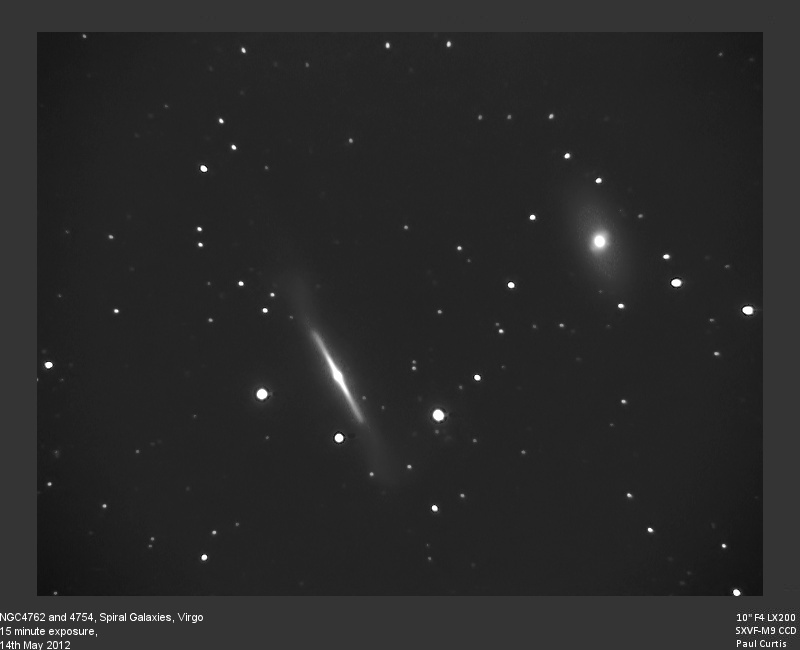 10" LX200 SCT at f10, Starlite Xpress Trius SX25C camera. 45 minute exposure. 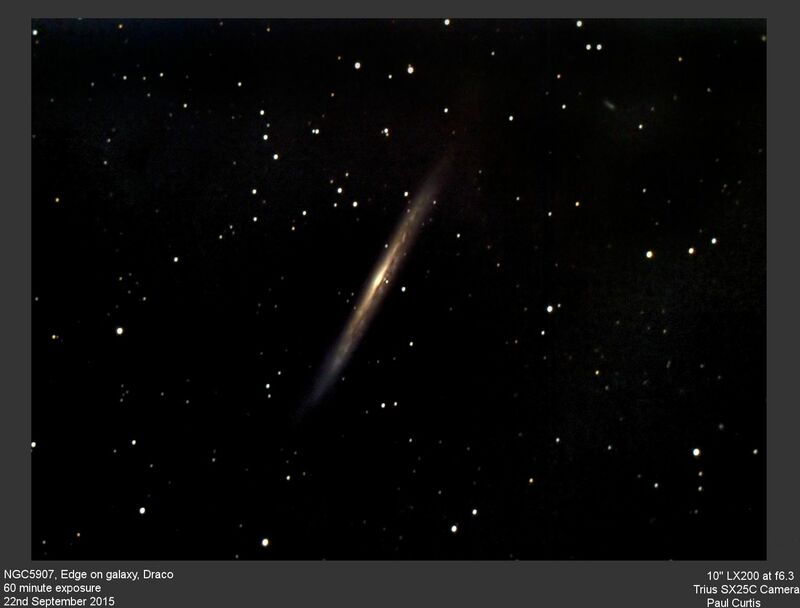 - 10" Meade LX200 SCT f4, Starlight Xpress MX9 CCD. 4 exposures : Effective integration time 12 minutes. 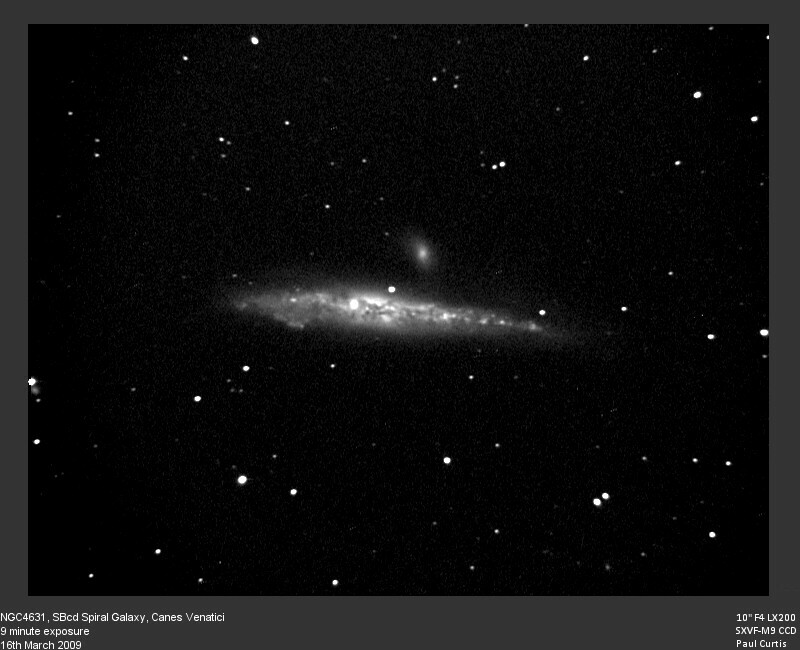 NGC4244 Spiral Galaxy in Canes Venatici, Mag 10.4, 18.5 x 2.3' - 10" Orion Optics GX250 Newtonian f4.8, Starlight Xpress MX5 CCD. Multiple exposures : Effective integration time 10 minutes. 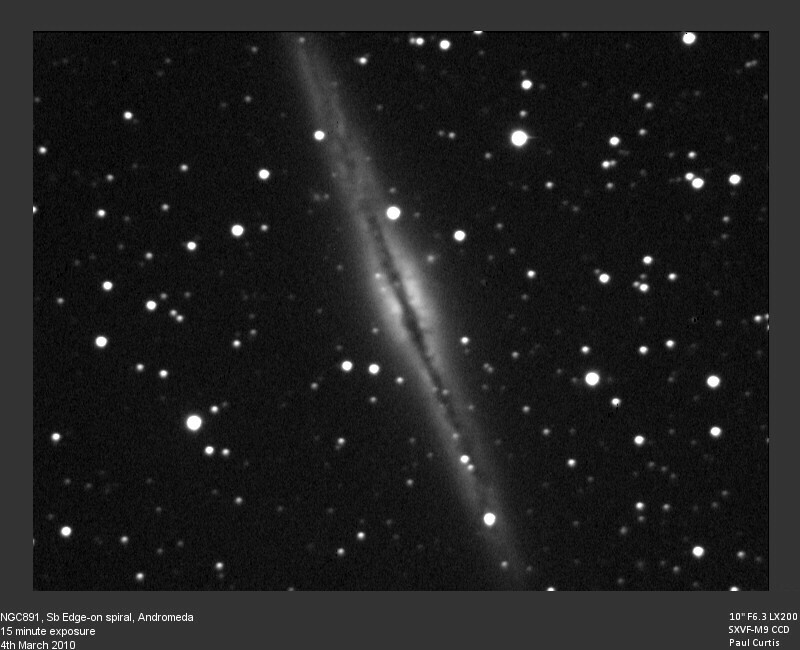 NGC4631 -Edge on Spiral Galaxy in Canes Venatici,Mag 9.2, 17' x 3.5', NGC4627 adjacent.- 10" Meade LX200 SCT f4, Starlight Xpress MX9 CCD. Multiple exposures : Effective integration time 9 minutes. 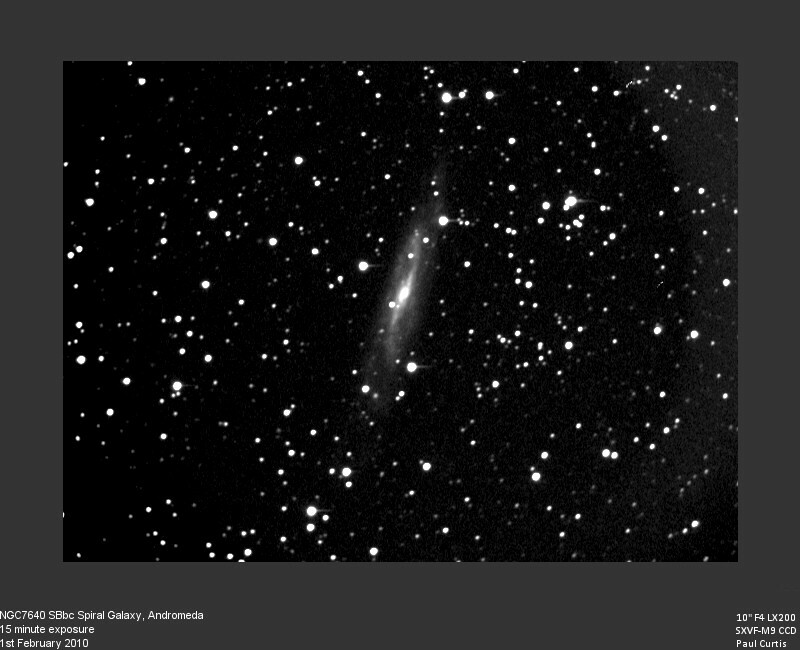 NGC891 Sb Spiral Galaxy in Andromeda, Mag 9.9, 14' x 3' - 10" Meade LX200 f6.3, Starlight Xpress MX9 CCD. Multiple exposures : Effective integration time 15 minutes. 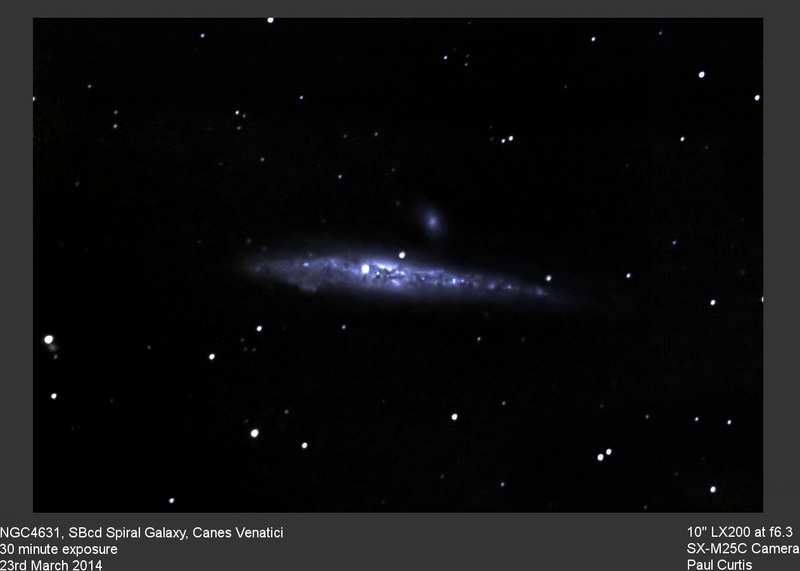 NGC3079 Sb Spiral, Ursa Major, Mag 10.9, 8.7' x 1.6' - 10" Meade LX200 SCT f6.3, Starlight Xpress MX5 CCD. Multiple exposures : Effective integration time 24 minutes. 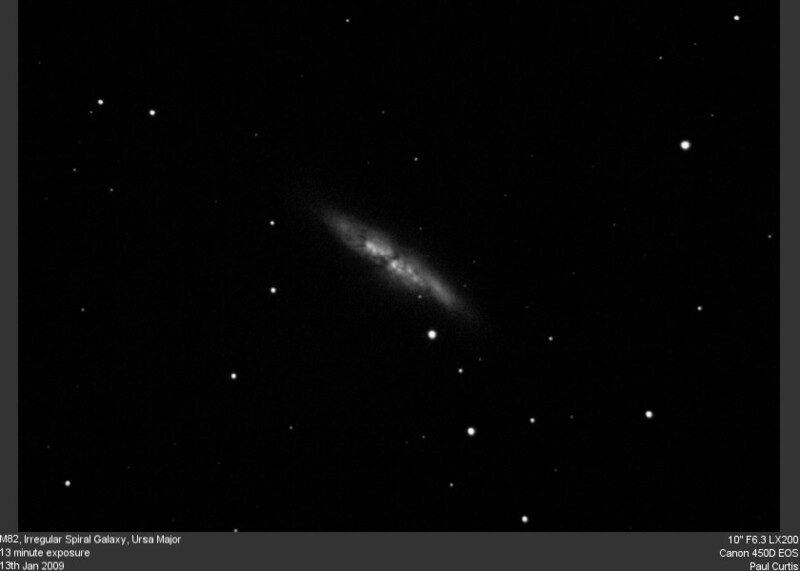 M82 Ip Spiral Galaxy in Ursa Major, Mag 8.4, 13 x 6' - 10" Meade LX200 SCTf6.3, Canon 450D EOS. Multiple exposures : Effective integration time 13 minutes. 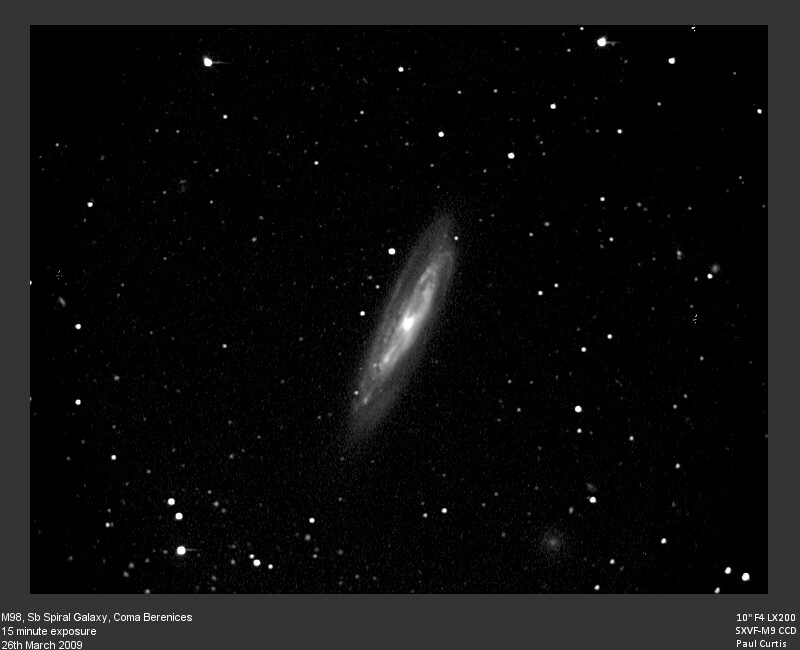 - 10" Meade LX200 SCT f10, Starlight Xpress MX5 CCD. Multiple exposures : Effective integration time 6 minutes. 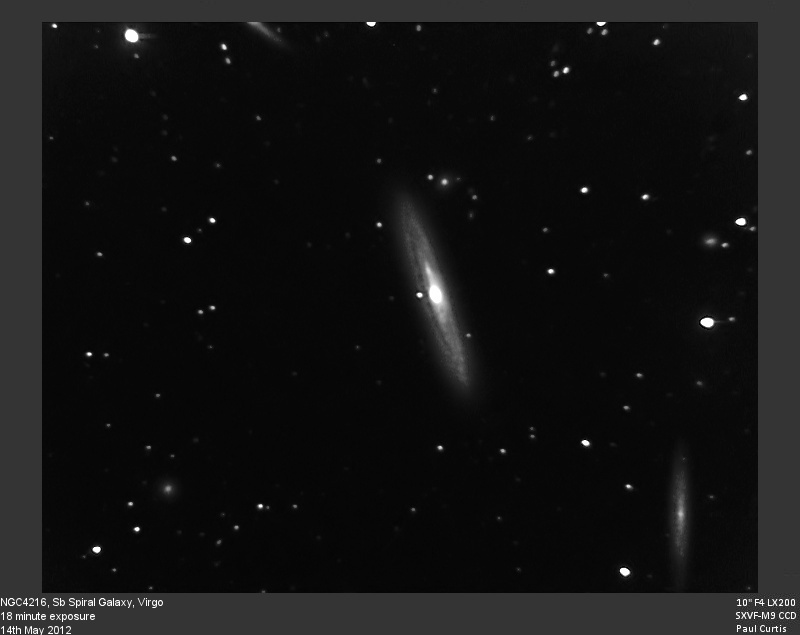 NGC7332 and NGC7339, E7 Elliptical and Edge -on Spiral Galaxies in Pegasus. 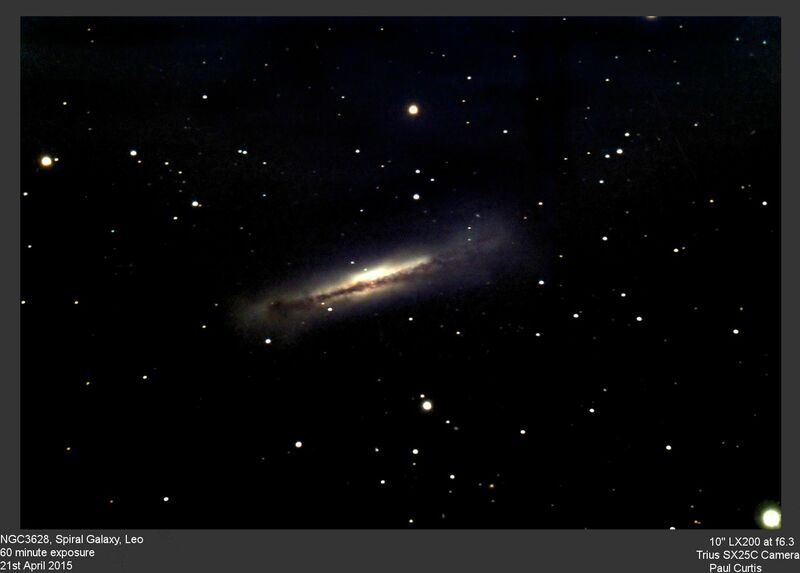 10" LX200 at f6.3, Starlight Xpress MX5 CCD. Multiple exposures : Effective integration time 15 minutes. 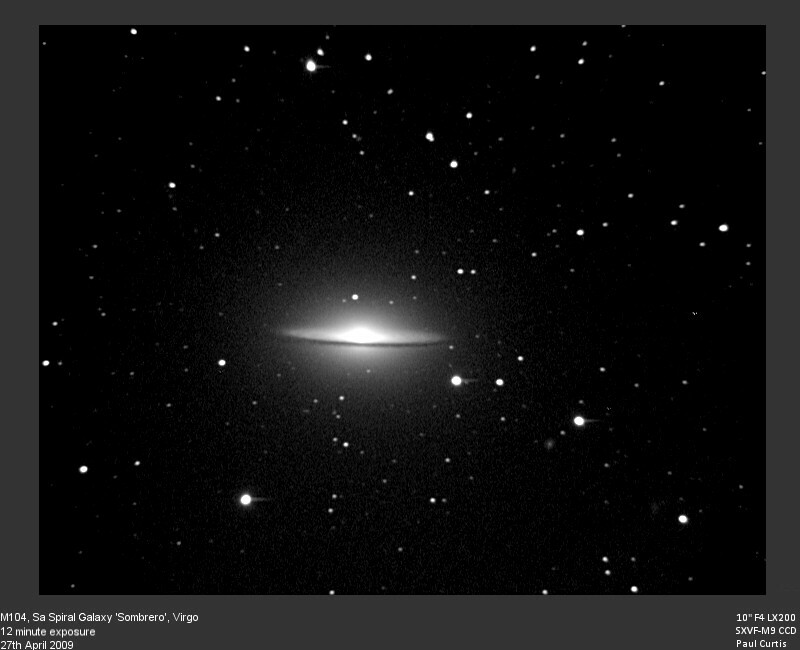 NGC 7640 - Edge-on spiral galaxy in Andromeda. 10" LX200 at f4, Starlight Xpress SXVF MX9 CCD. Sum of five 3 minute exposures. 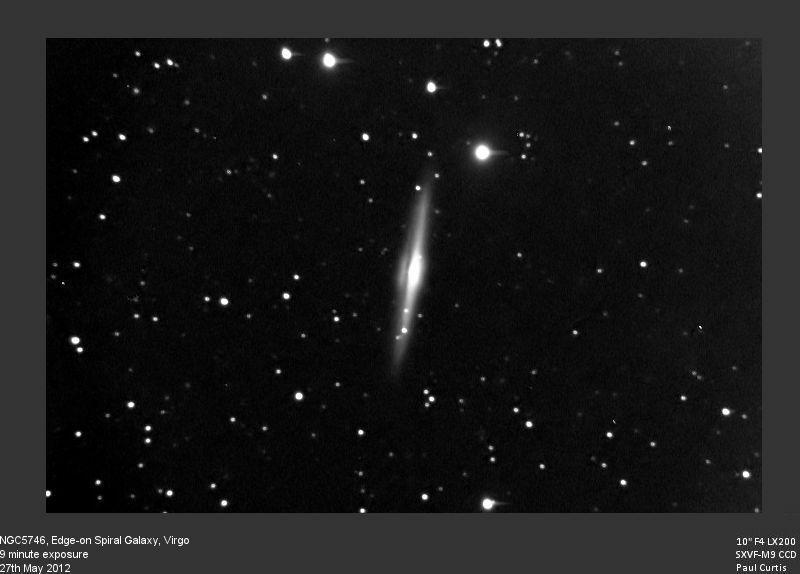 NGC4762, Edge-on Spiral Galaxy, Virgo. 10" LX200 SCT at f6.3, Starlight Xpress SXVF-MX9 CCD. Effective exposure 15 minutes. May 2012. - 10" Meade LX200 SCT f4, Starlight Xpress SXVF-M9 CCD. 3 exposures : Effective integration time 15 minutes. - 10" Meade LX200 SCT f4, Starlight Xpress SXVF-M9 CCD. 3 exposures : Effective integration time 9 minutes.